Lip products are some of my favourite things to write about. I love experimenting with different colours, textures, brands and price points. MODELROCK Cosmetics create some of my personal favourite lip shades and formulas. They have recently expanded their amazing lipstick selection, adding a long wear lip definer to the mix. Their Vivid Lip Shapers range come in both a SkinnyStixz & ChubbyStixz variety. Benefits include: Jojoba Oil, Hydrogenated Cottonseed Oil, Vitamin E moisture antioxidant; and Vitamin C a natural skin antioxidant. Vivid Lip Shapers are longwear lip shapers that will last for hours and can be layered with any of your preferred MODELROCK Lip products. Waterproof, long-wearing, and opaque, your Vivid Lip Shapers won’t feather upon application nor dry out your lips! I am really fussy when it comes to lip liners, if they arent creamy, pigmented and longlasting then I dont want to waste my time. Skinny Stixz Vivid Lip Shapers are a dual-purpose product. You can shape and define your lips making them appear bigger or smaller whatever tickles your fancy, or fill in the rest of your mouth. The formula is super-moisturizing and they glide on smoothly without tugging on the lips. Best of all they are insanely pigmented, it will last through a greasy meal like you wouldn’t believe. Create a bold smile with a velvety smooth finish that will last for hours with MODELROCK SkinnyStixz VIVID Lip Shapers. A highly-pigmented Lip Shaper, your colour glides onto lips consistently, easy to blend after application and perfectly defining and shaping your lips. Chubby Stixz Vivid Lip Shapers are so much fun to use, they seriously look like adult crayons and the child in me just can’t get enough of them. I like to first outline my lips then fill them in, it applies evenly and goes on incredibly smooth. The formula feels moisturising, leaving my lips looking naturally fuller. The colour payoff is superb, once it sets it does not move. These Chubby Stixz have become a handbag staple and I will always have one on hand. MODELROCK ChubbyStixz VIVID Lip Shapers will infuse your lips with high impact colour that lasts for hours. They’ll glide on effortlessly with a creamy, velvety smooth feel that appears silky matte or pearlescent in colour, providing excellent coverage. Price: MODELROCK Vivid Lip Shapers Chubby Stixz & Skinny Stixz $15.00 AUD Each – You can purchase these lip products online from www.modelrocklashes.com – Also available through professional make-up artists, beauty salons, beauty wholesalers, hairdressing salons, luxury hair salons, and spa/beauty lounges. Let me know what you think of these lip products and which colours are your favorites. Me too Kez, I’m so impressed! I didn’t know MODELROCK did lip products! I love the funky packaging! They have designed the packaging so well! They are fantastic Rachel! Very pigmented and long lasting! I think it would suit just about anyone. It’s such a pretty shade! I love Model Rock lashes so I will definitely need to check out their lip range, especially the shade Honey Love! I haven’t tried any Model Rock products before, so these colours look so beautiful! Oh i wish I had read this earlier! 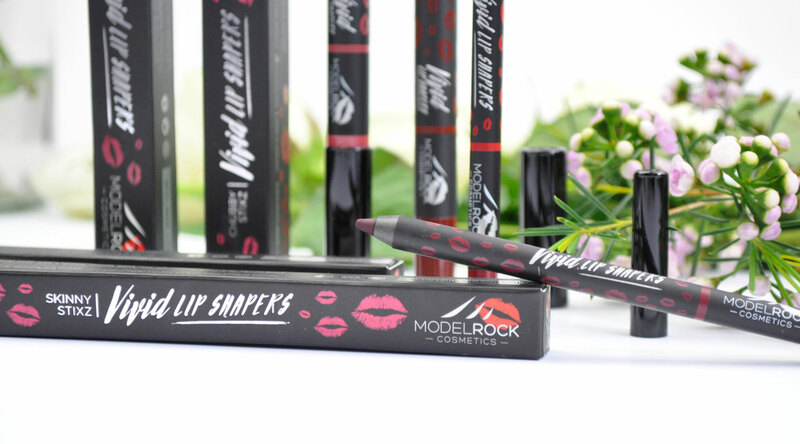 My sister is a makeup artist and I went with her to check out some products yesterday they had the ModelRock range and I totally would have grabbed a lipliner to try, they sound really good! Next time!